The so-named "Miracle on the Hudson" seems a bizarre thing to make a movie about. After all, the plane was in the air for six minutes before it landed, how could you possibly dedicate a feature length film to that story? As impressive and inspiring as the event is, a film seemed almost impossible due to how short the whole thing lasted. Yet, here we are, and Clint Eastwood has drafted in Tom Hanks to retell the story of just what happened when US Airways Flight 1549 hit a flock of geese and lost both of its engines while climbing the sky, and it just so happens to not only be a terrific piece of mainstream cinema, but one of the best releases of the entire year full stop. Hanks' terrific performance Eastwood's confident direction are pretty much a given in anything they work on, but what really pushes this film into greatness is the area of the event that it focuses on, and just how quietly powerful the whole thing is. Sully begins days after the event. 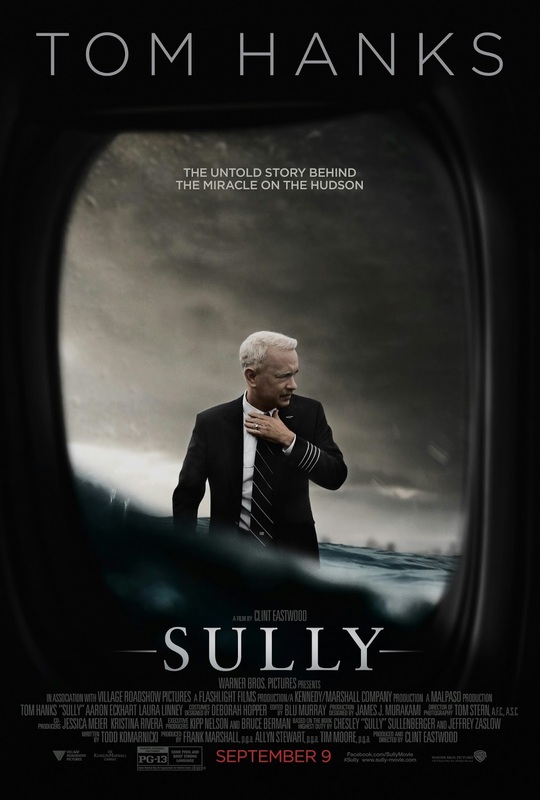 After diverging a potential plane crash by landing successfully on the Hudson River, Captain Sullenberger, known as Sully (Tom Hanks), is being hailed a hero by everyone around him, even though he suffers from PTSD and frequently experiences visions of the plane crashing into New York City. Soon after the event, he and copilot Jeff Skiles (Aaron Eckhart) are brought into questioning from a legal board who claim that Sully's decision was reckless and dangerous, and they inform him that one of the plane's engines was still functional and that he could have safely returned to a local airport. The film's decision to focus on the aftermath of the event is a brilliant move. While the main selling point is unquestionably the plane crash itself, a feature film documenting that would not work. Eastwood and screenwriter Todd Komarnicki's decision to focus the film on the court case afterwards allows that selling point to feel magnified: rather than build up to the event and watch it once, the film skips the set up and shows us what happened three or four times from varying perspectives. Miraculously, it retains its intensity. The film feels impressively quiet and focused when the camera sticks to ground level, but any time the film makes the leap to the sky, Sully becomes something quite special. Tom Hanks is just one of those actors that you don't really need to worry about when you head into a film. Even some of the best actors working today can bring a sense of doubt with some casting decisions, but Hanks is an exception to that rule. As Sully, he is just as reliably brilliant as you'd expect. He exudes doubt and vulnerability during the film's quieter moments, but perfectly counters that with the command and control he brings whenever the film pits him against those who question him. The film's script has terrific control over Sully as a character in that he is so believably vulnerable when he is alone but also so confident in the trial sequences, and yet it doesn't feel like character inconsistency. Hanks' performance here is mostly very quiet and subdued, but the flashbacks to the event show a whole different side to this character. As the film begins after the event, there are no soppy farewells between him and his family, and so our admiration for him as a character comes from his handling of the plane crash. Hanks performs these sequences terrifically; we hear the panic and fear in his voice, but we don't question his abilities at any moment. It's another superlative performance from him, and it undoubtedly continues his streak of Oscar worthy roles. Standing up against Hanks is tough, but the rest of the cast hold their own, particularly Eckhart. While Jeff isn't given as much emotional complexity as Sully, Eckhart delivers a number of the film's funniest lines (particularly the final line of the film), and works perfectly alongside Hanks in the landing sequences. Whilst Hanks' performance is good enough to carry the film, what makes Sully so effective is the way the film is structured. Because of the film's chosen narrative, the final act incorporates a number of simulations of the same event, and it's to Eastwood's credit that these simulations feel just as intense as the real thing. The film has done such a terrific job at selling these characters and this scenario to us that we are just as invested in the outcome of the simulations that only affects their jobs as we are in the plane crash that affects their lives. It's the way in which Eastwood perfectly maintains the tension that the film manages to feel so thrilling despite staying so quiet and collected. The film isn't quite a character study in that too much time is dedicated to supporting characters for it to feel like one, instead it falls softly in the middle of a narrative film and a character film, creating something that excels masterfully in both areas. The way in which Eastwood also manages to rope in elements of horror and comedy just boost the whole thing further. There is extreme horror in the flight sequences (which, by the way, invest us into the passengers as characters far better in five minutes than most actual horror films manage at feature length), and there are a brilliant handful of one liners that keep the film on its toes when it's grounded. Eastwood has succeeded in crafting a film that feels thrillingly intimate and intimately thrilling all at once. It's a powerful and exciting biopic that seamlessly navigates around every cliche it could fall into, and instead feels wholly singular and original. Sully takes on a lot in such a short run time, and it sticks every landing. This is fast, thrilling film-making, and it proves that even with true stories, investment in the characters is important, no matter the genre. Eastwood and Hanks working together sounds like a sure fire way to have a great time at the movies. Sully fulfils that promise, and then some. What a film. To Summarise: Under Clint Eastwood's confident direction, Sully is the rare biopic that favours subtelty over drama, forming a powerful and poignant story that hits terrific heights with Tom Hanks' typically stellar performance.